Reflections… An instant slideshow in my head with pretty pictures of reflections on water. But I have no idea how to design elements with reflections. Plus, simulating water and its’ reflections in Photoshop sounds like hell… for me at least 😉 I spotted some pretty flowers on the waterside when doing a google image search on reflections, and my mind pondered over the flower. Flowers… Reflections… Where have I heard this before? A flower reflecting in… Wait, I know! Narcissus is an astoundingly beautiful young boy, so wrapped up in himself he feels he is too good for any of his suitors. One day, he rests near a silvery lake. When he bends over to drink the water, he sees his own reflection and falls madly in love with himself. But whatever he does, he cannot touch or kiss this newfound love. When he finally realizes it is his own reflection, his heart breaks and he wastes away and dies… His body is never found, but on the lakeside a yellow flower appears, encircled by a white flower crown. This flower is believed to be the “Narcissus” or as we all know it: the daffodil. Lovely. The painted daffodils are beautiful. Thank you. Lovely kit and great story, thanks for sharing. Thanks! I love the daffodils and the paint! Thank you for your Reflections interpretation and the story it is very interesting and lovely. 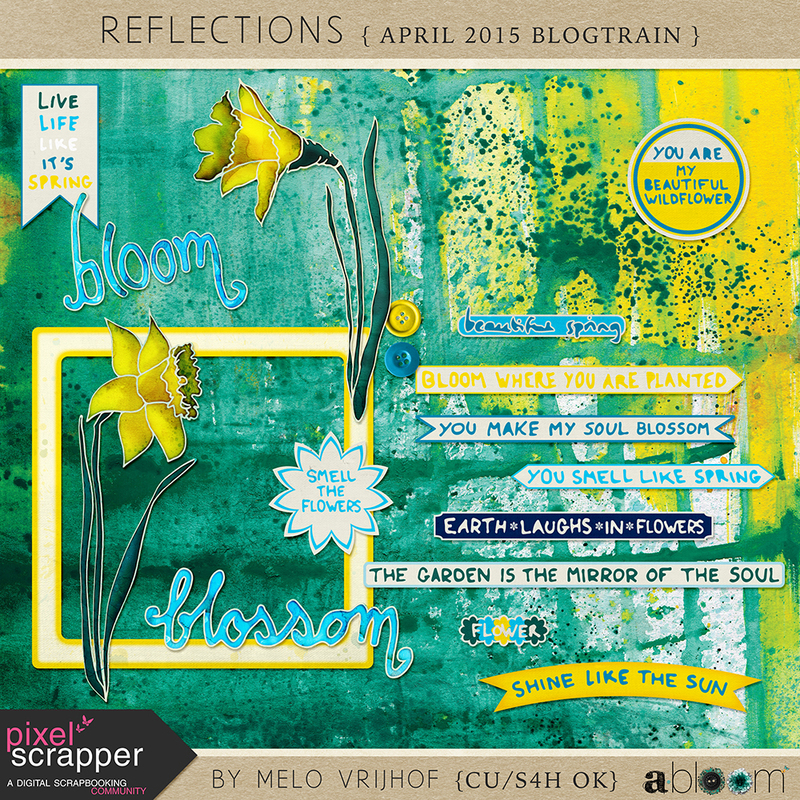 I love you daffodil’s style – they have a feeling of cut glass! Thanks for the story of Narcissus too. Love the background and the word art! Thanks a lot! This is such a beautiful kit. It has been so much fun watching your style change and evolve over the years. I am loving this art journal direction you’ve gone in and you pull it off with so much creativity and skill. I think this such an original, creative interpretation of the theme! i love your arty scraps, thank you! I love this beautiful kit! I love daffodils and now they will always remind me of the story of Narcissus. I knew the story but didn’t remember about the daffodils. Thanks for the story and kit! thank you for this beautiful kit!! the lovely story that goes with it makes it even more precious. Gorgeous kit!! Just gorgeous!! Love the colors!!! Beautiful daffodils!! The splat is lovely!! Fantastic word art!! Loved your story… I had not thought about it in years!! Thank you so very much for sharing!!! Thank you for sharing your talents and I loved your story. here from Pixel Scrapper. Beautiful kit! Love the idea! Love the artsy look of your mini — thank you! & thanks for sharing the story behind your inspiration!